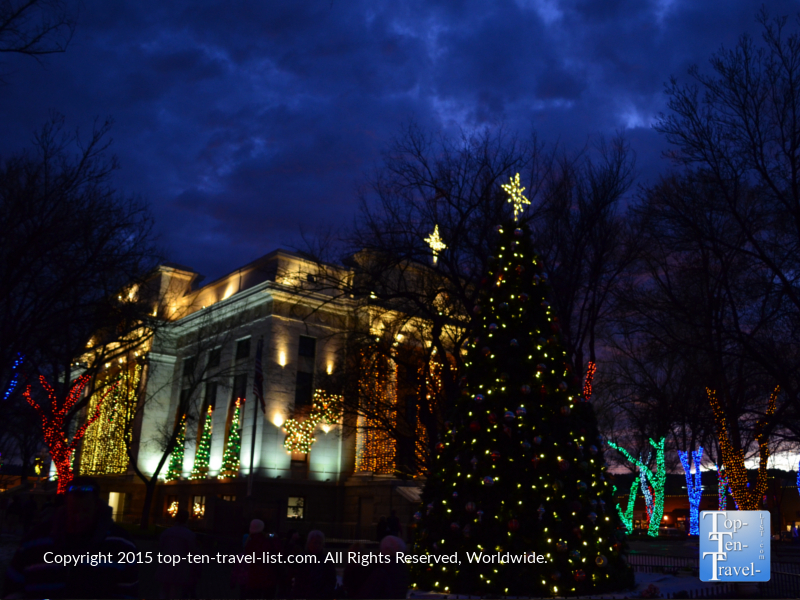 Prescott: "Arizona's Christmas City" - Top Ten Travel Blog | Our experiences traveling throughout the US. 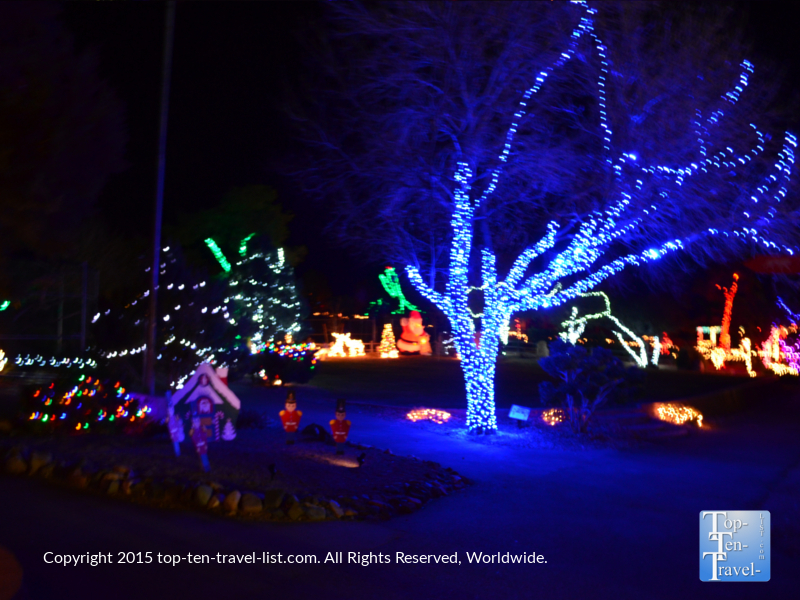 Prescott, Arizona was labeled “Arizona’s Christmas City” in 1989 by Governor Rose Mofford. With an attractive 4 season climate (including cooler temperatures in December and a slight possibility of snow! 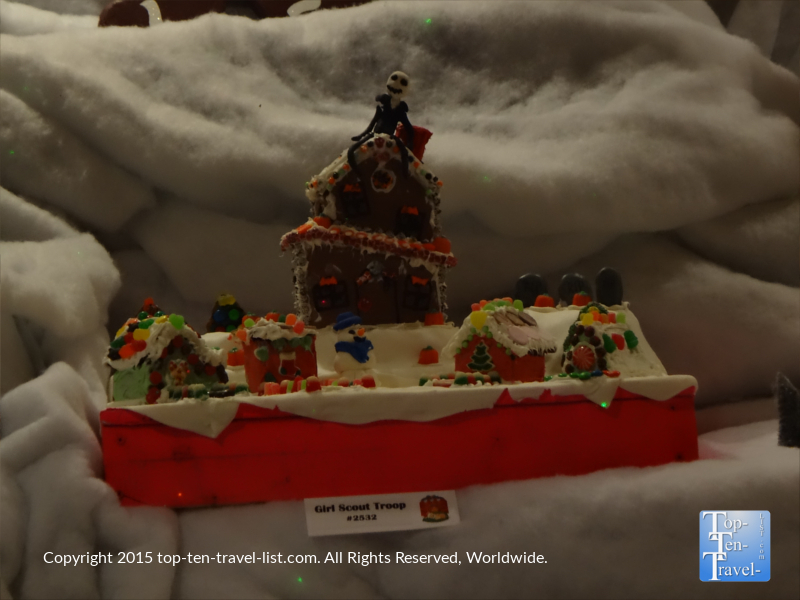 ), historic Victorian architecture, and a whole lineup of festive holiday activities, Prescott claiming the Christmas title comes as no surprise! 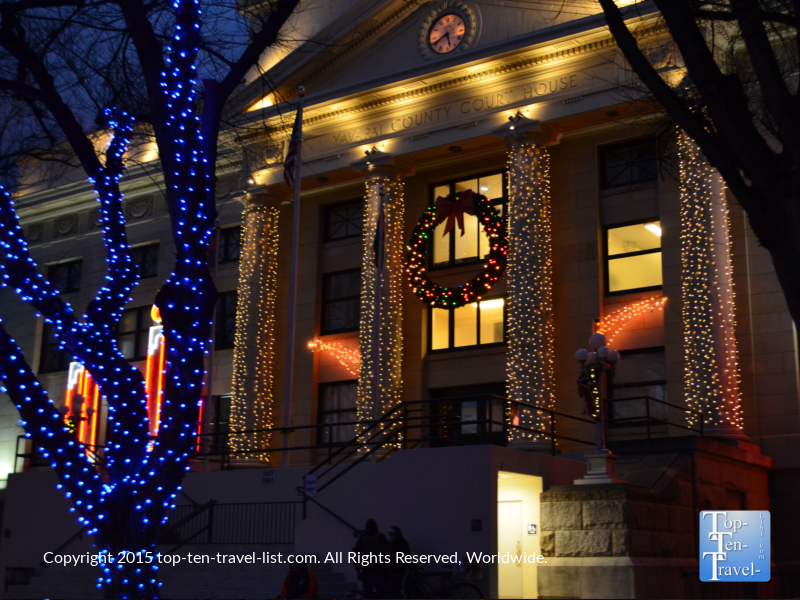 During the holiday season, Prescott is most well known for their extravagant lighting ceremony at the Yavapai County Courthouse, an event in which more than a 100 trees are sparkling with nearly a million colorful holiday lights. 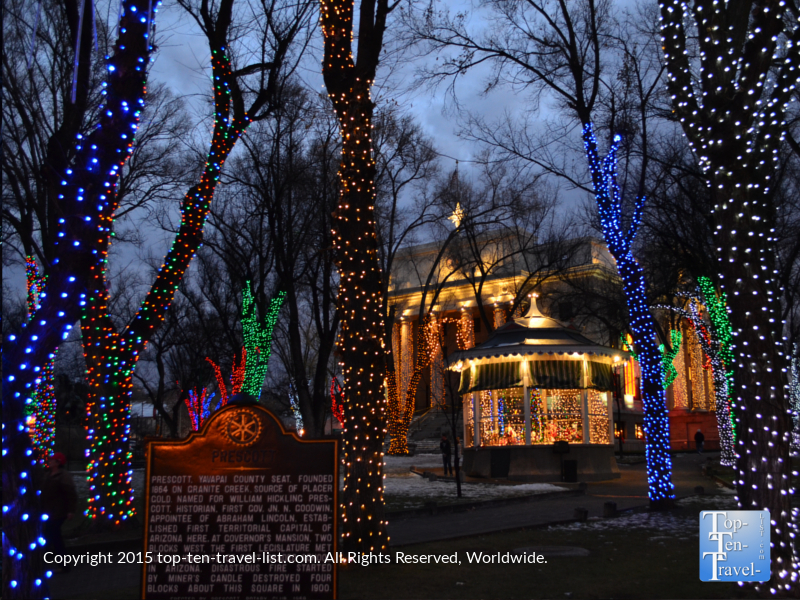 This year marks the 61st lighting, which kicks off on December 5th with a parade, a reading of the Christmas Story, and holiday carols. 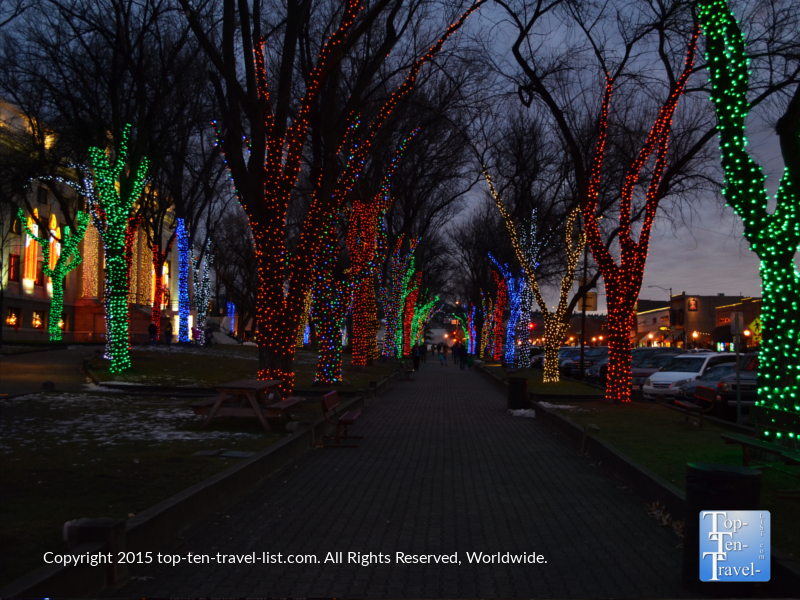 Even if you can’t make it to the opening ceremony, you must plan a time this holiday season to stroll around the festive grounds of the plaza. 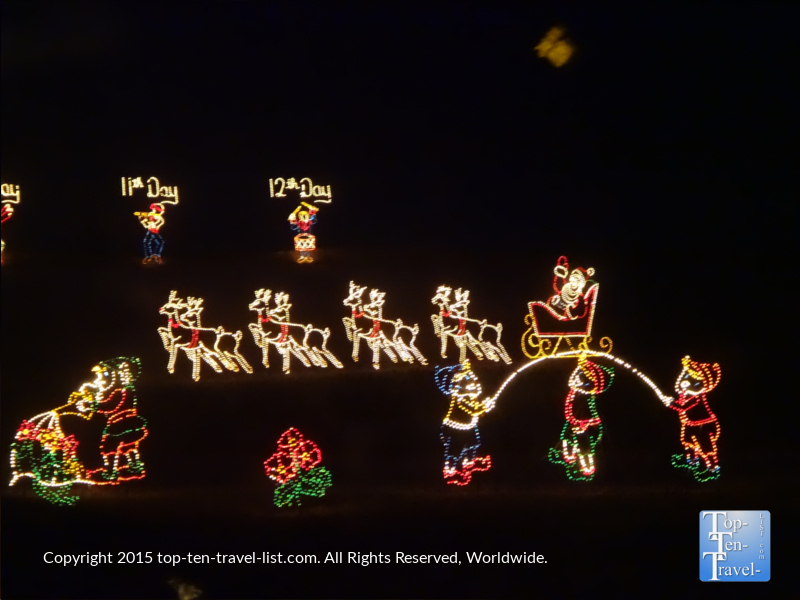 The lights stay up until mid-January, so you have plenty of time to plan a visit. 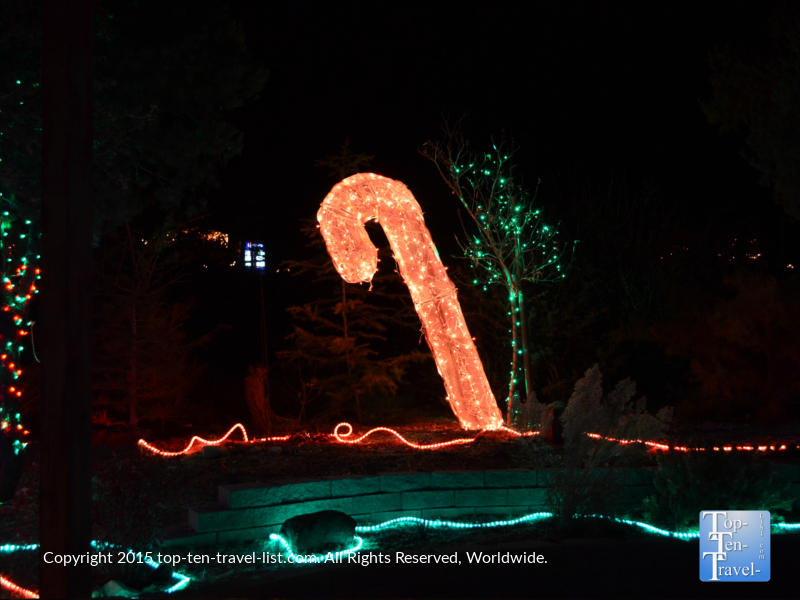 Other seasonal holiday events occurring late November through the New Year include: Wild Lights at the Heritage Park zoo, the downtown Holiday Lights Parade, the World’s Largest Gingerbread Village at the Prescott Resort and Conference Center, The Valley of Lights drive-thru holiday spectacular at Fain Park, Enchanted Christmas at the Prescott Gateway Mall, free weekend holiday carriage rides downtown, various Christmas plays, holiday craft fairs and bake sales, and much more! 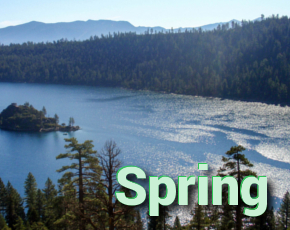 Prescott, with a population of just 40,000, offers more of a small town feeling that most of Arizona, complete with a historic downtown, charming old homes and buildings, an abundance of local shops and restaurants, and dozens of community events spread throughout the season. 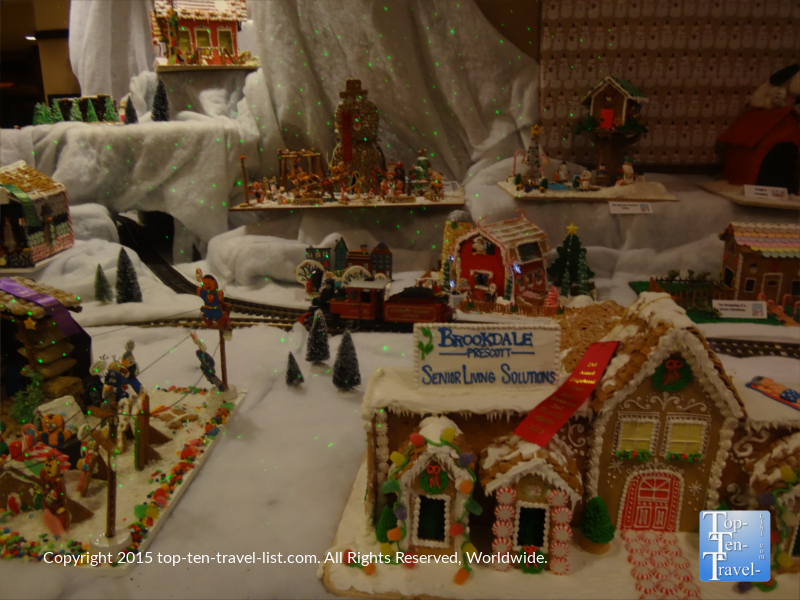 These combining factors have led Prescott to be known as the best place in Arizona to celebrate an old fashioned Christmas! Although just under a 2 hour drive from Phoenix, Prescott (situated at an elevation of 5400 feet) luckily does not share the same crazy hot weather. 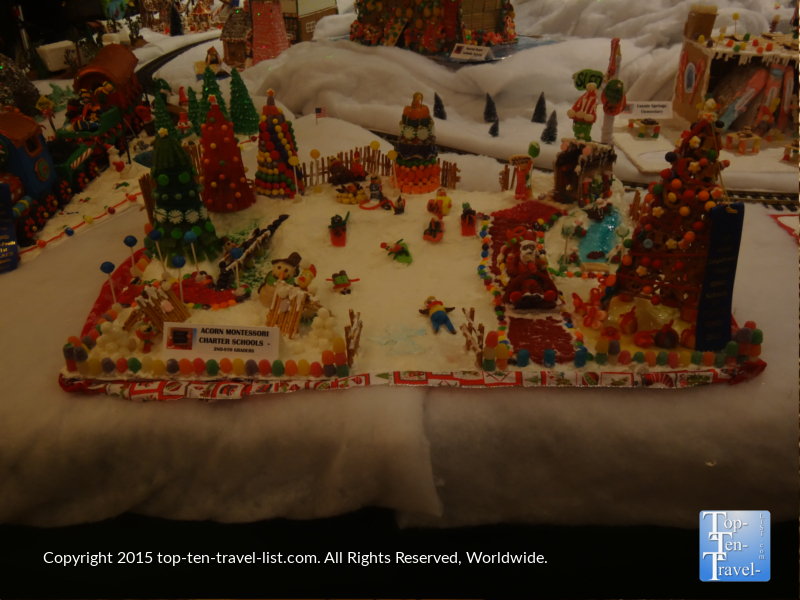 In fact, the city is known for having one of the most desirable 4 season climates, one that includes both mild summers and winters, thus making it a popular retirement and 2nd home destination. Winter highs are typically in the 50’s with the occasional chance of snow due to the low (often freezing) nighttime desert temps. 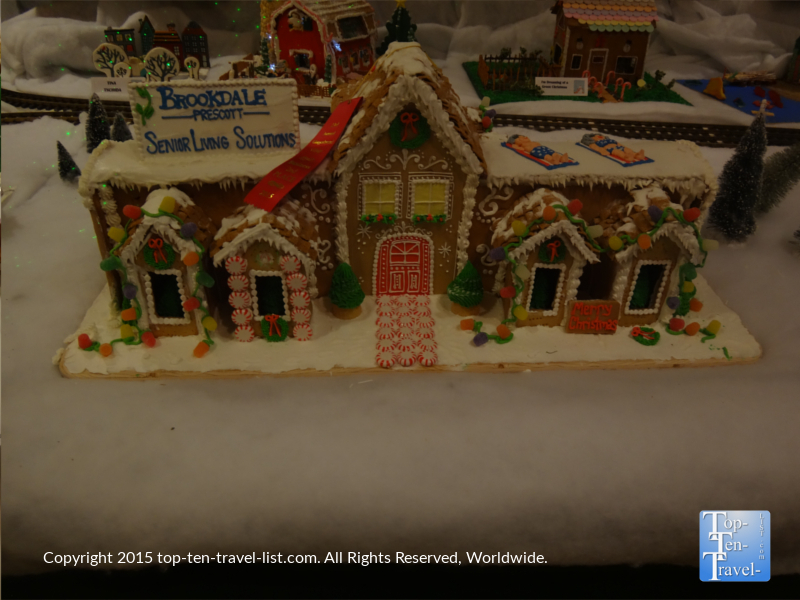 Take a look at a few of the must attend holiday events for 2015! 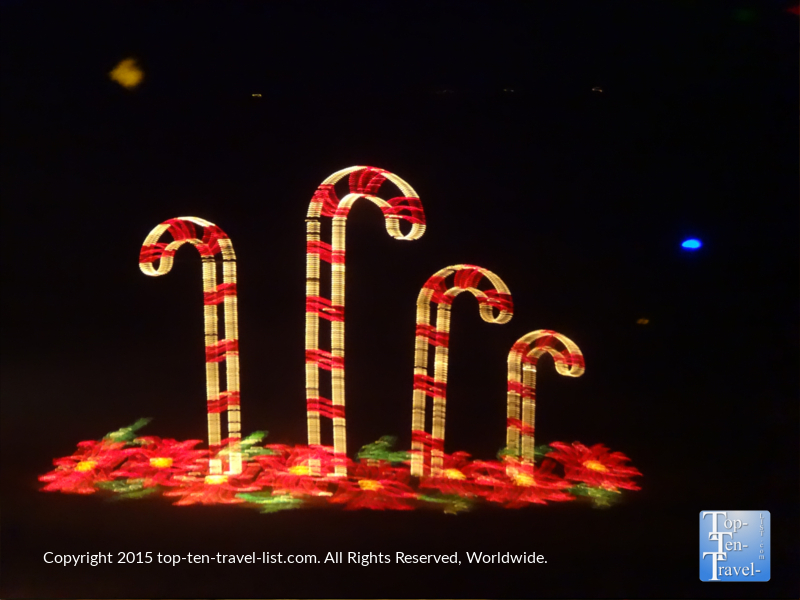 This year marks the 20th year of the popular holiday lights parade, taking place along the streets of historic downtown. 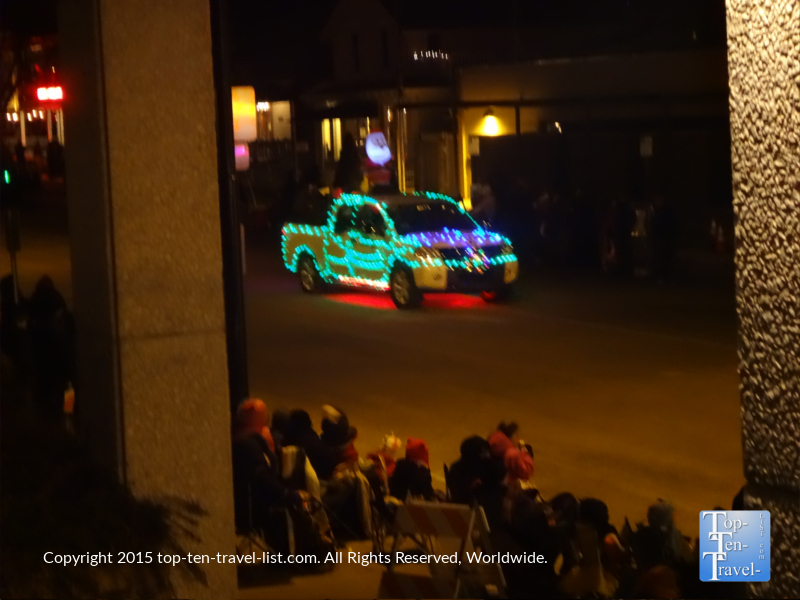 So much effort is put into this lively 2 hour parade, which features decked out floats, cars, and trucks. 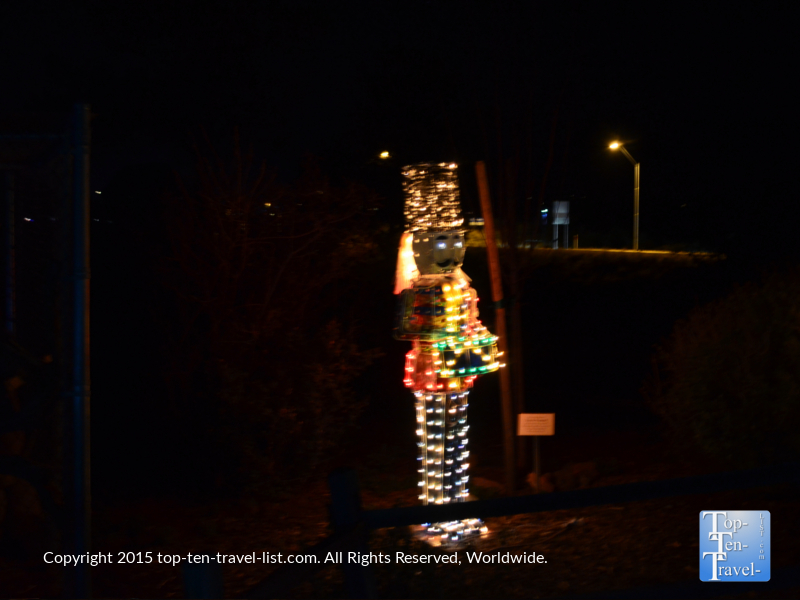 Many local businesses really go all out with the lights, creating the ultimate festive setting. The brisk nighttime temps (be sure to wear a hat, gloves, and scarf! 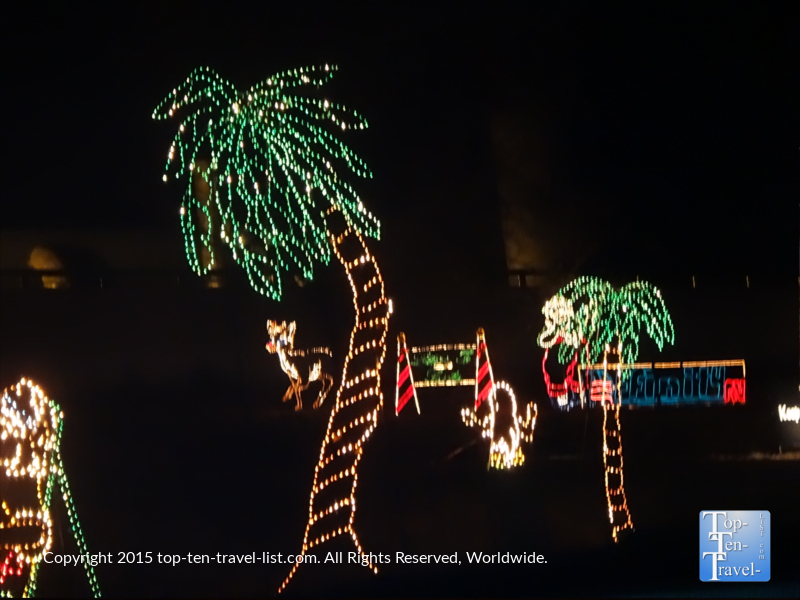 ), enthusiastic mix of locals and tourists, and bright lights really create an enjoyable holiday setting. 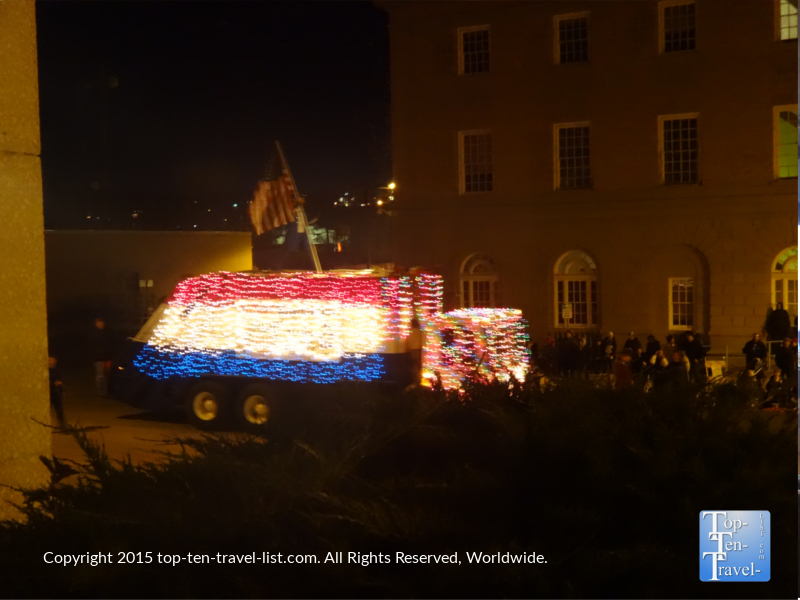 This year’s parade, held on November 28th from 6-8pm, featured 40 fantastic floats. 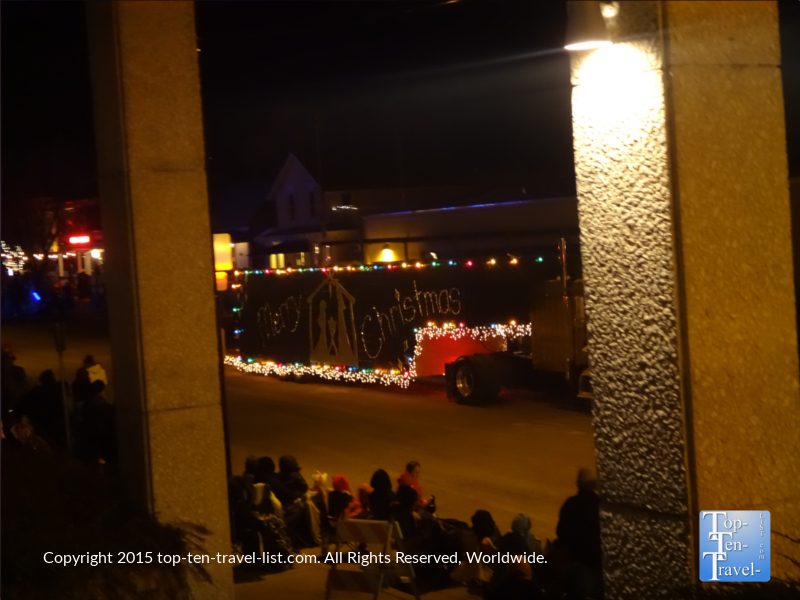 Prescott’s Holiday Lights Parade is definitely event to put on your calendar for 2016! 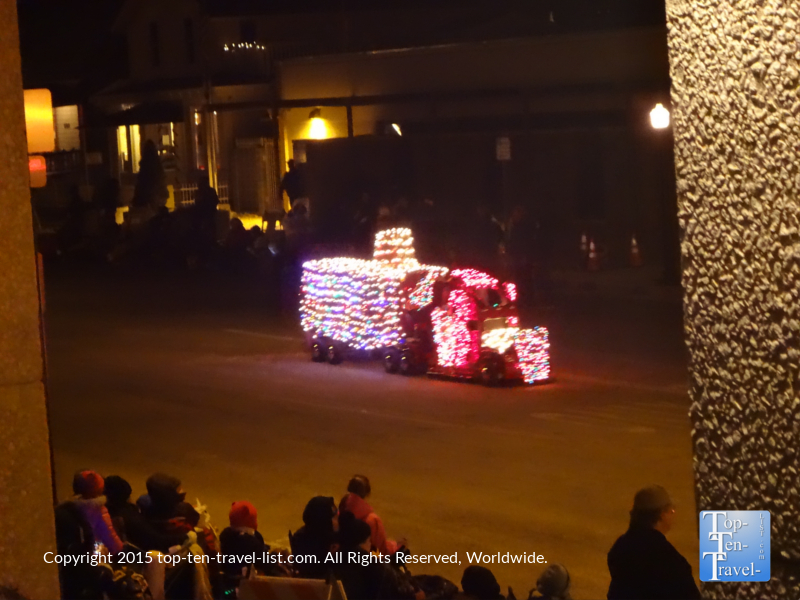 Stay updated on times/dates for next year’s parade and other holiday events by visiting the Prescott Downtown website. 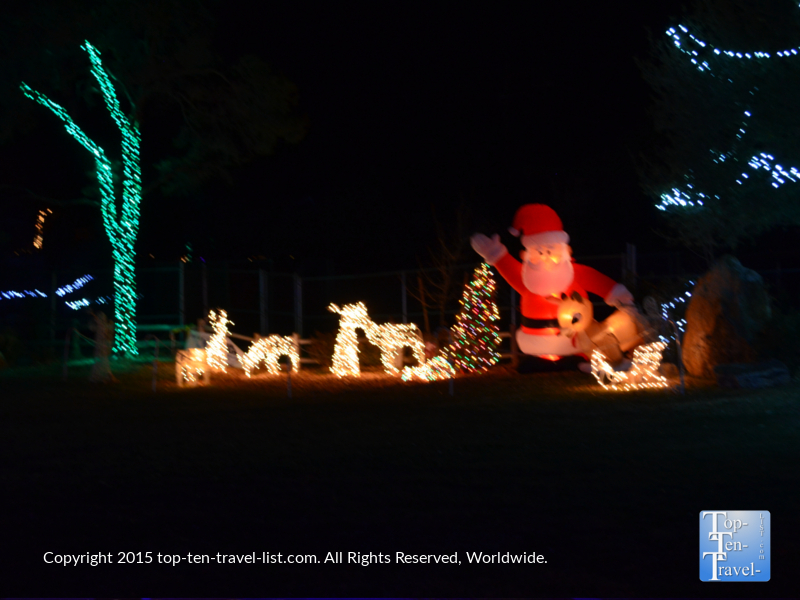 Each year, Prescott’s quaint Heritage Park Zoo hosts a spectacular holiday zoo lights event known as Wild Lights. The zoo is very small (just 10 acres! ), yet still houses a diverse range of animals (a black bear, tiger, mountain lion, Mexican wolf, coyote, lemur, bobcat, and a variety of birds and reptiles are a few of the notable zoo animals you will come across). Heritage is not your typical zoo: all the animals found here have been rescued. 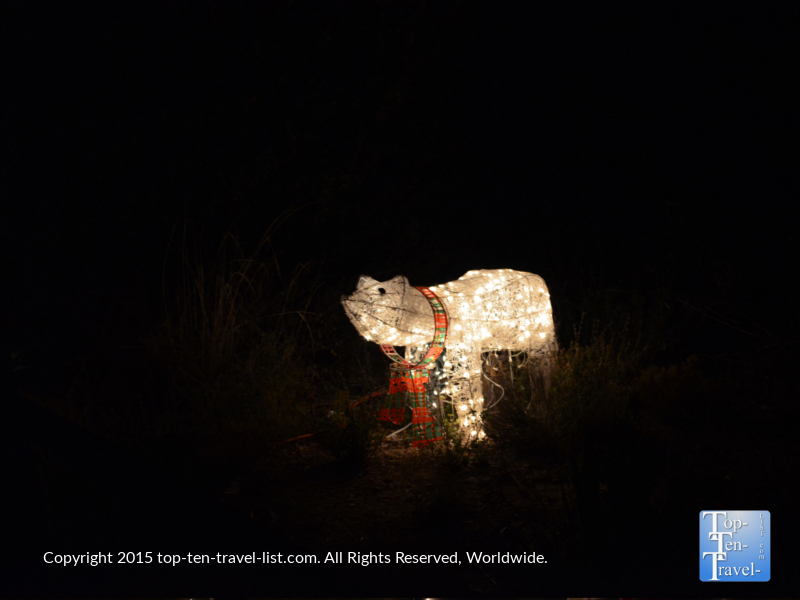 A variety of specialty and seasonal events including Wild Lights give locals and guests the opportunity to see the zoo in a new light throughout the year. 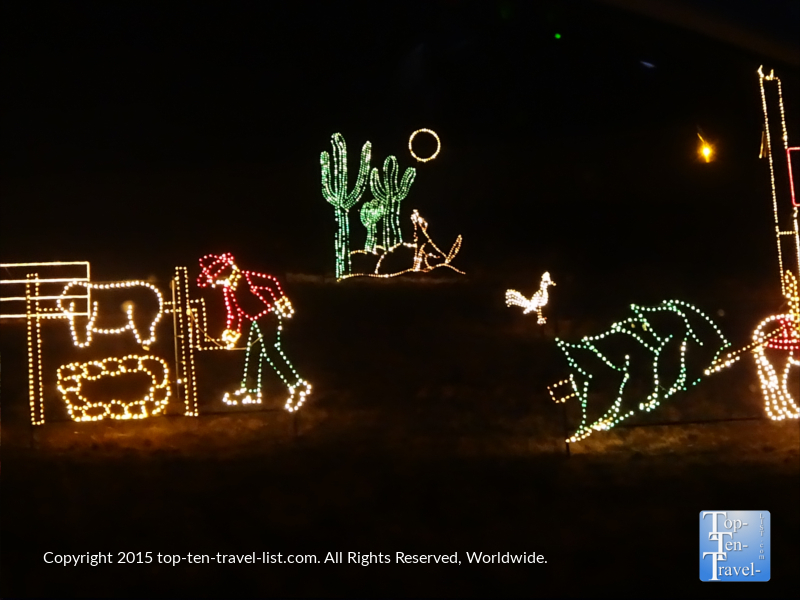 Wild Lights features an attractive layout of lights and various holiday and animal themed wire displays. 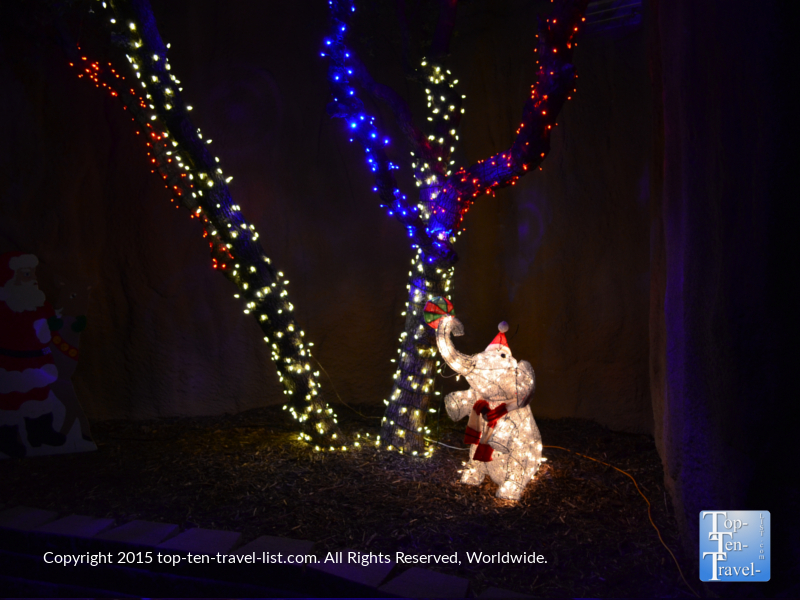 In addition to enjoying the colorful lights, you may even see a few animals out! We were able to see most of the animals aside from the black bear and a few of the cats. It’s pretty dark, however, volunteers are around to help shine a light to help you out! If you are from a big city, you may be a bit dissapointed in the display as it will not be as extravagant as what you are used to. Walking the grounds of Heritage will not take more than a half hour or so. 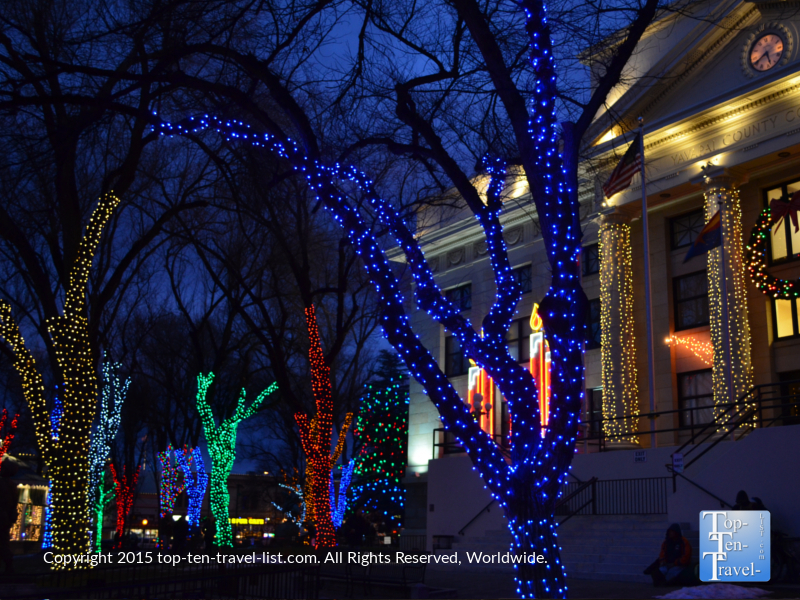 However, if you happen to be visiting Prescott this holiday season, it’s definitely worth visiting as it’s only 5 buck and quite peaceful (no big crowds like the big city zoos!). 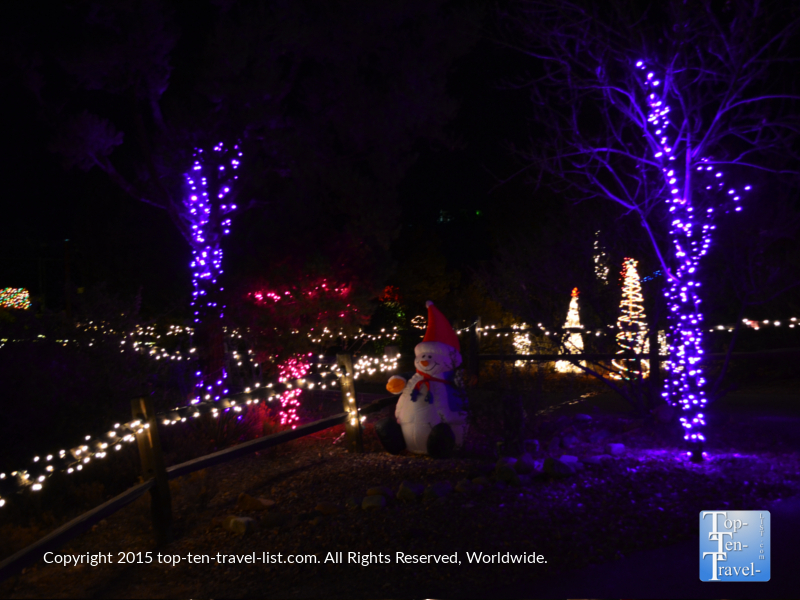 Grab a hot cocoa in the visitor’s center and enjoy a leisurely stroll around this attractively decorated, yet not overdone zoo lights event. 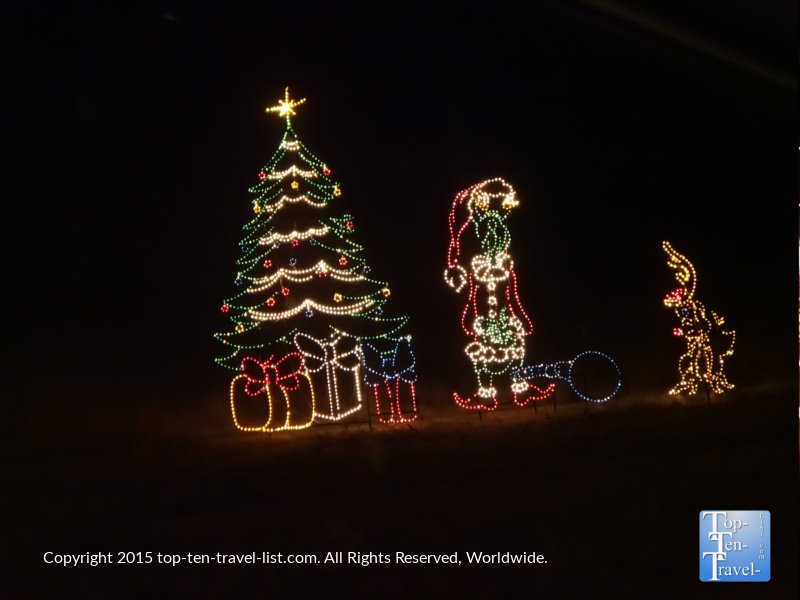 It’s a great little holiday activity that doesn’t cost a lot and will not take up your whole night. 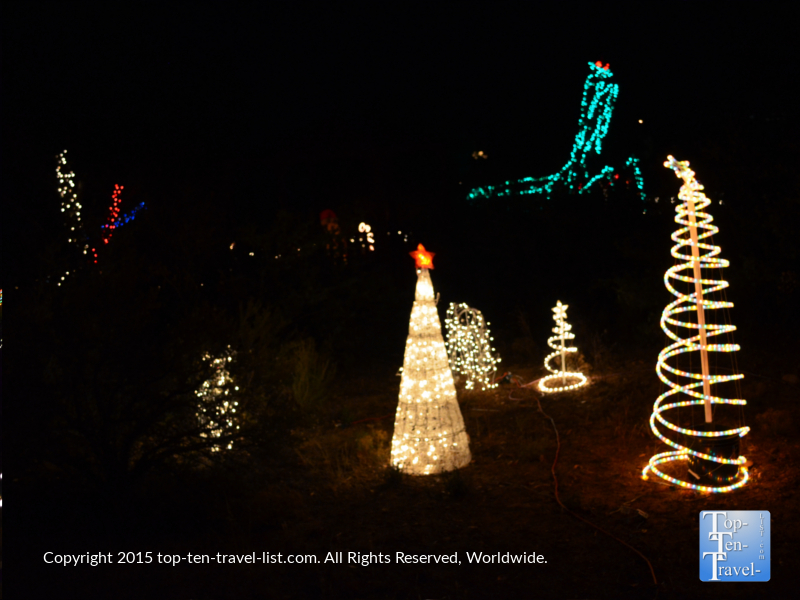 Wild Lights runs on Friday and Saturday nights from 6pm-9pm, from November 27th-January 2nd. 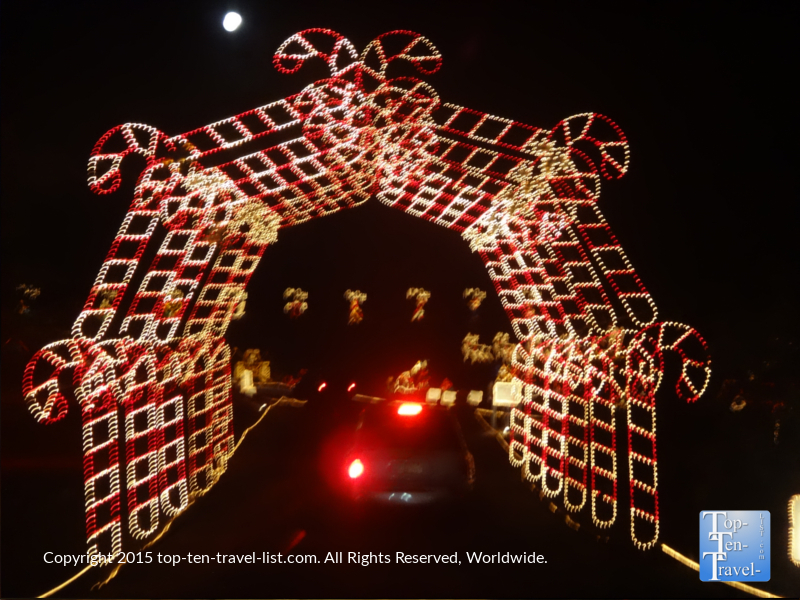 One of the top Prescott holiday traditions to check out this season is the amazing Valley of Lights drive-thru holiday light spectacular. 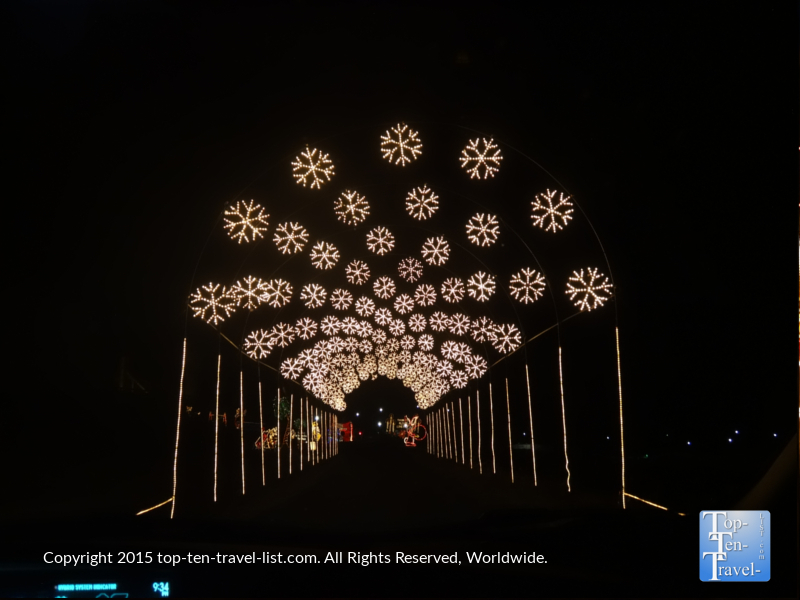 This gorgeous 1 mile pathway of lighted tunnels and displays in Fain Park is the must see in town. 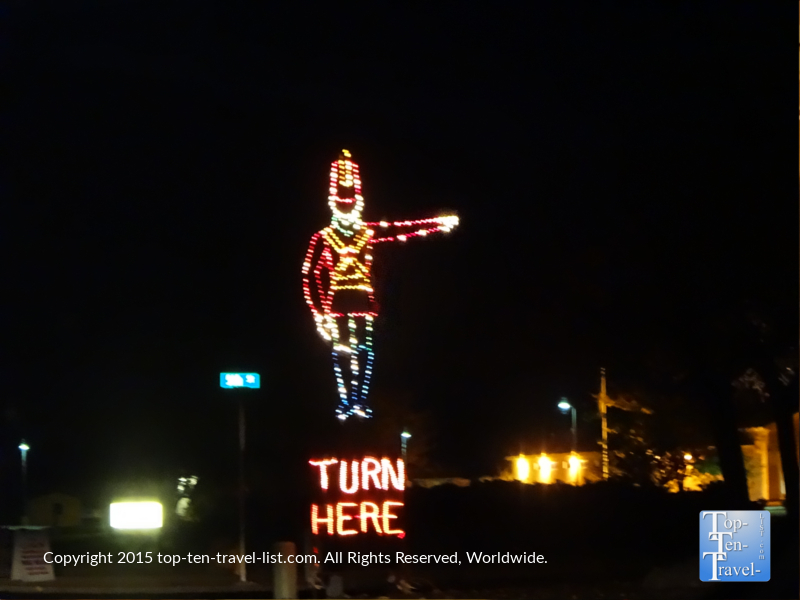 It’s one of the best drive thru light displays I’ve ever seen, and best of all, it’s completely free! 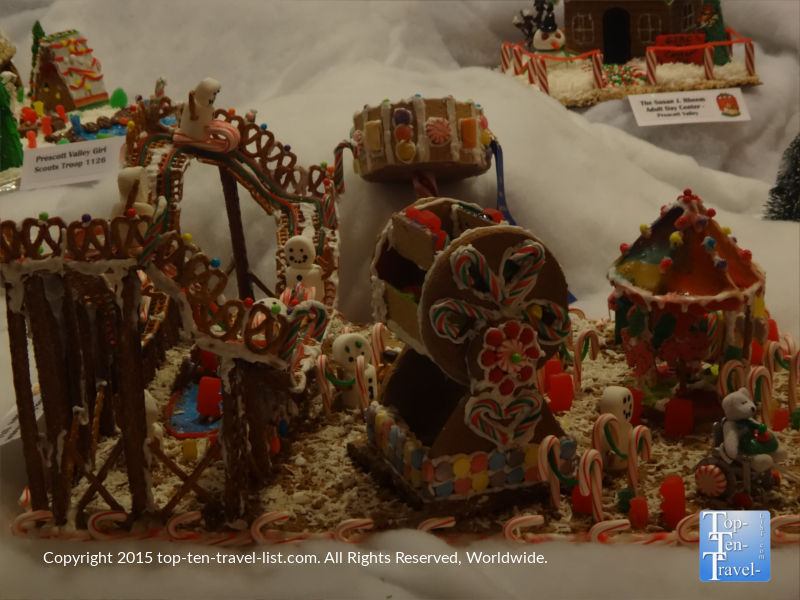 From your warm car, you will slowly make the trip through this Christmas wonderland. Bring with a to go cup hot chocolate to make it even more Christmasy. 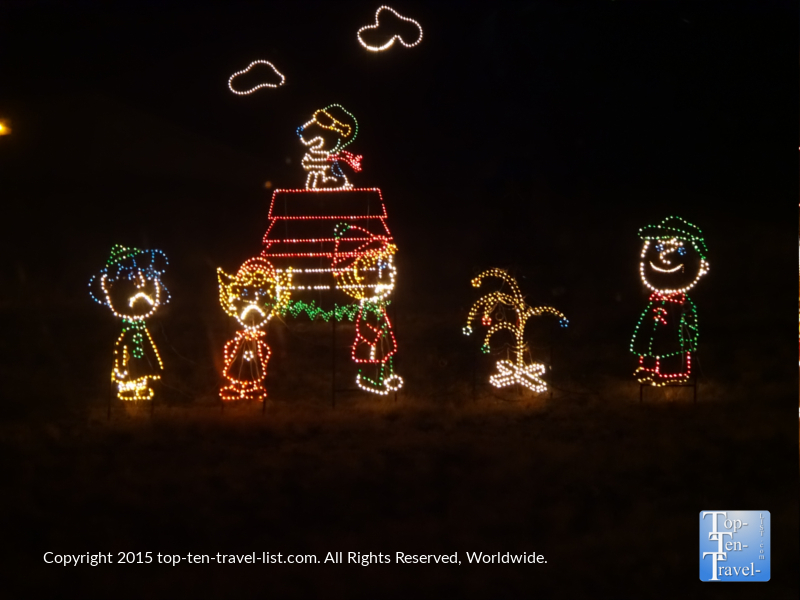 Along the mile long journey, you’ll see plenty of your favorite characters including the Grinch and the Peanuts gang. Santa and his reindeer are here too. 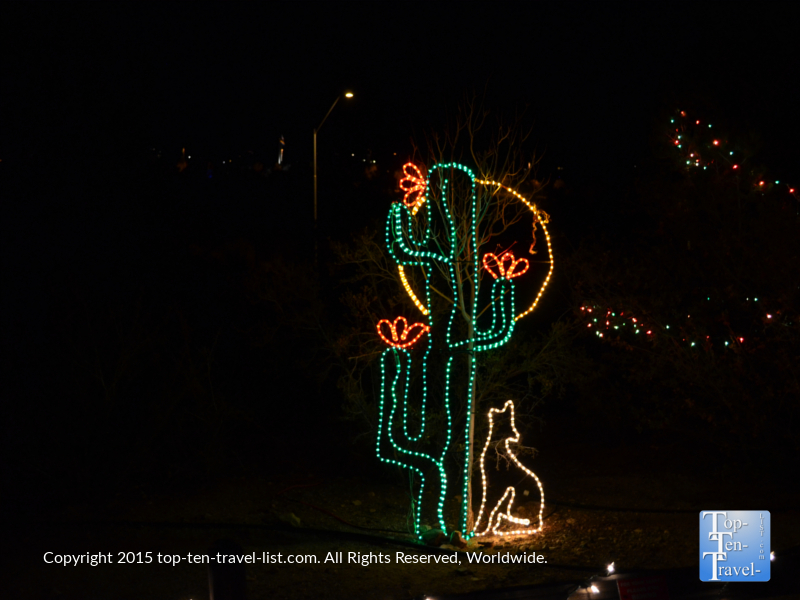 Add in a bit of local charm such as cacti and cowboy displays and you have a bit of everything! 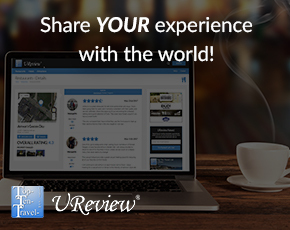 A really unique display – a job well done! 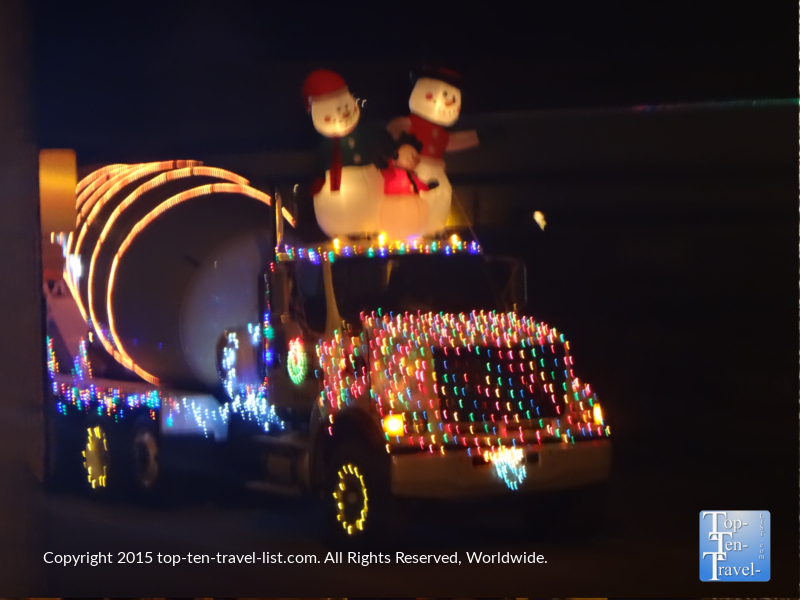 The best part by far is driving through the beautifully decorated tunnels. 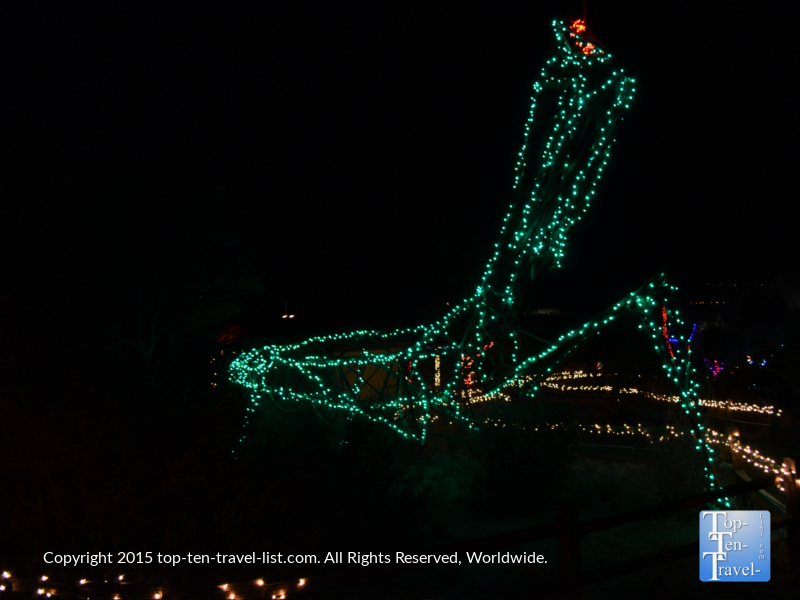 Prescott’s Valley of Lights is one holiday event you can’t miss! After all, it’s free, peaceful, and most of all, festive! A cute soldier points you in the right direction so you won’t get lost. From the highway, you will be able to see the large soldier. 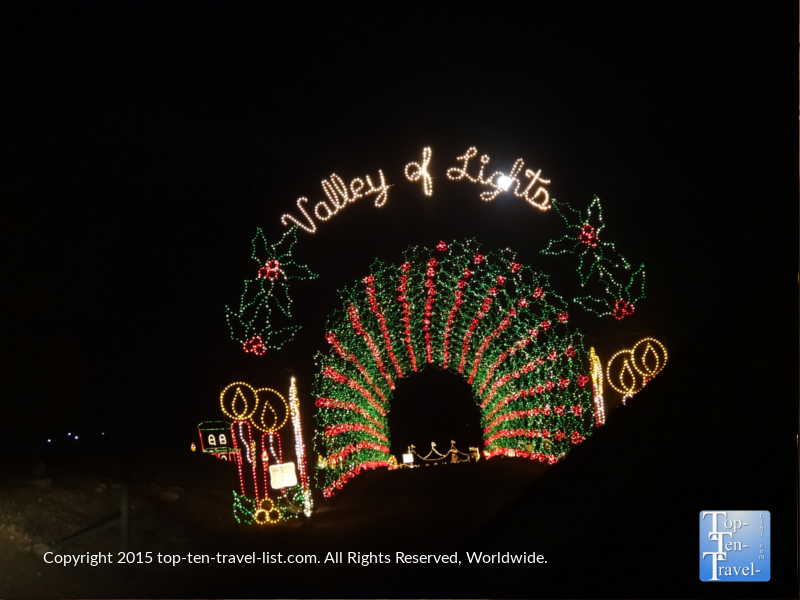 Valley of Lights runs from November 27th-December 30th from 6pm-1opm. 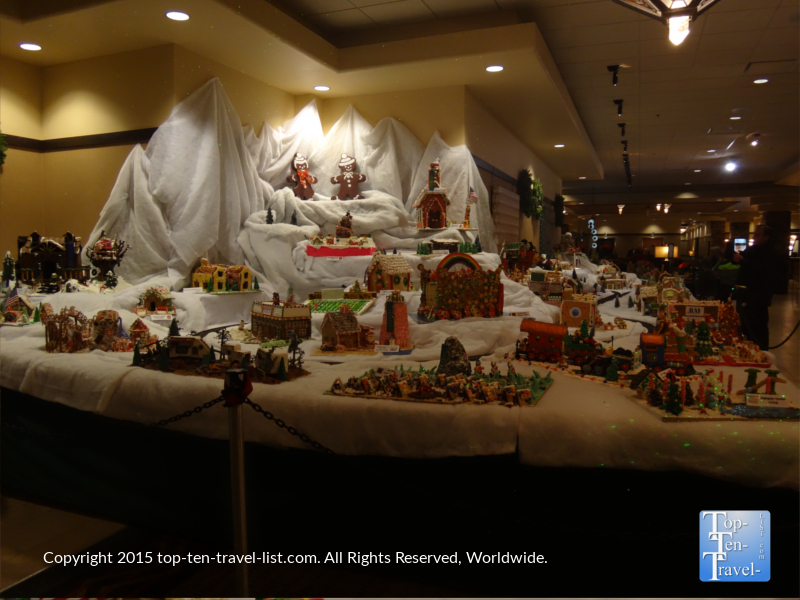 In the lobby of the Prescott Resort and Conference Center, you will find some beautiful holiday decorations, most notably the impressive gingerbread village display. 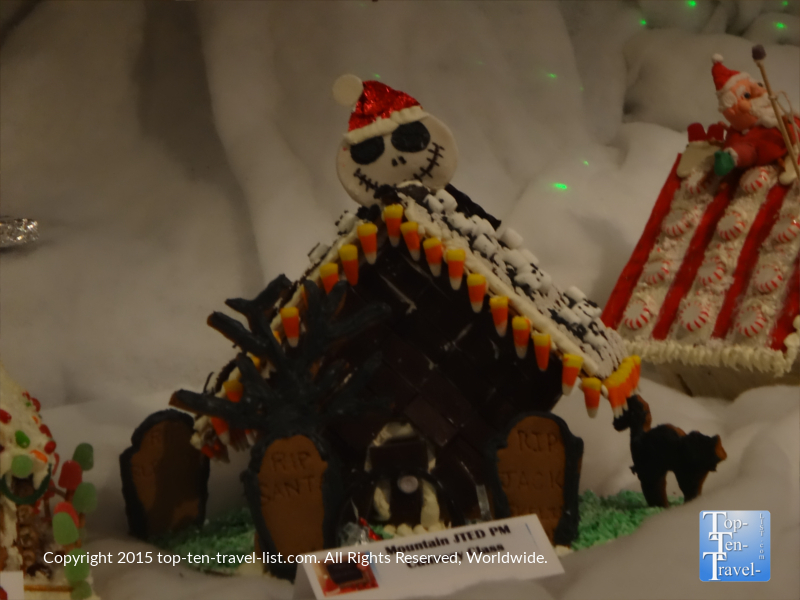 The attractive annual display features 100 or so diverse works of gingerbread art, from a unique A Nightmare Before Christmas inspired creation to artistic houses that resemble local businesses around town. 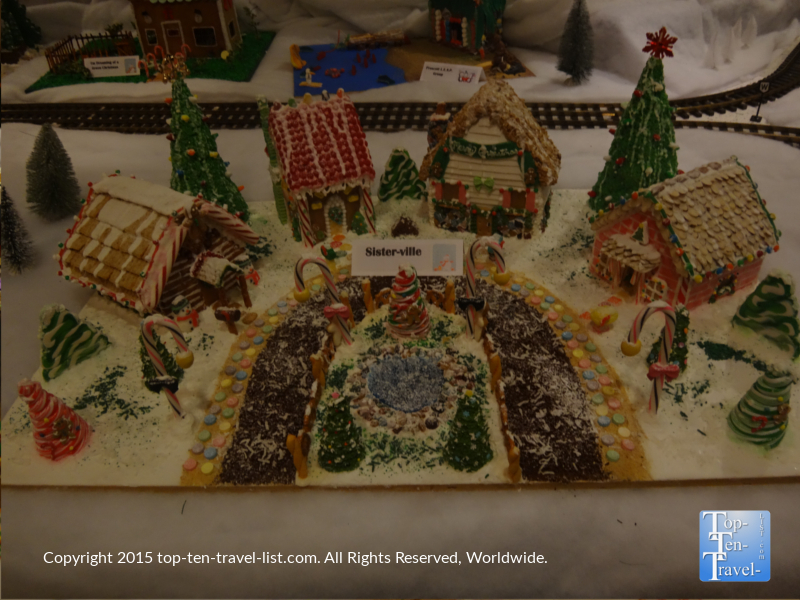 Although the display is quite large, it’s not the largest gingerbread village, despite the title. 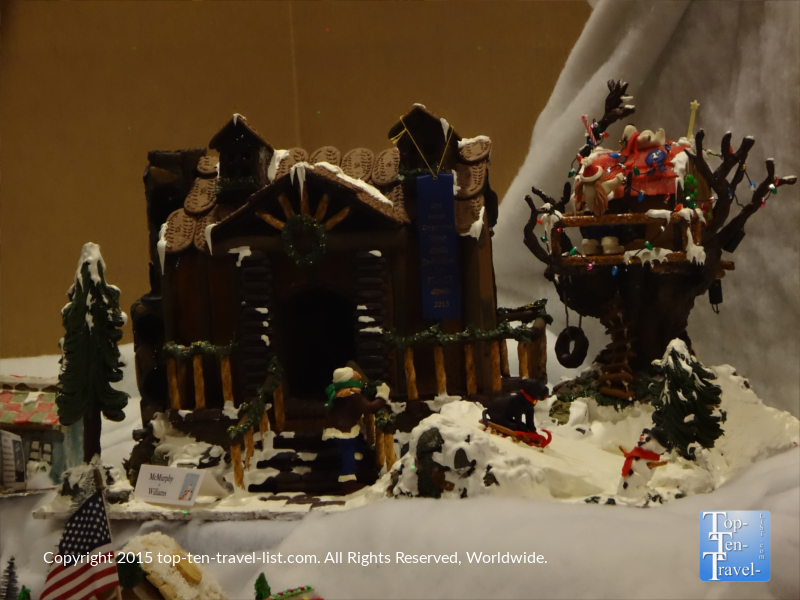 That award goes to the 1102 piece gingerbread set up at the New York Hall of Science in Corona by artist Jon Lovitch. 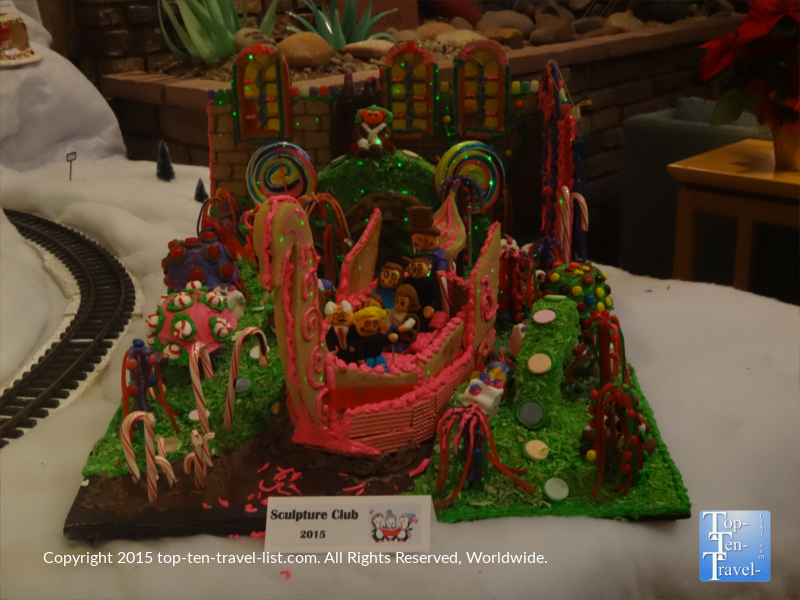 This year is the 3rd time the artist has won the Guinness World Record for largest gingerbread village. 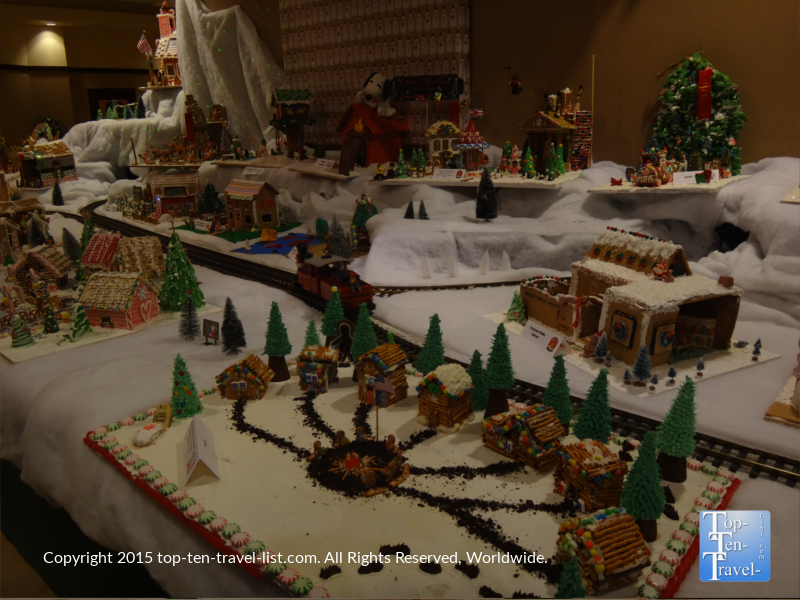 Prescott Resort’s Gingerbread Village is free of charge to explore. 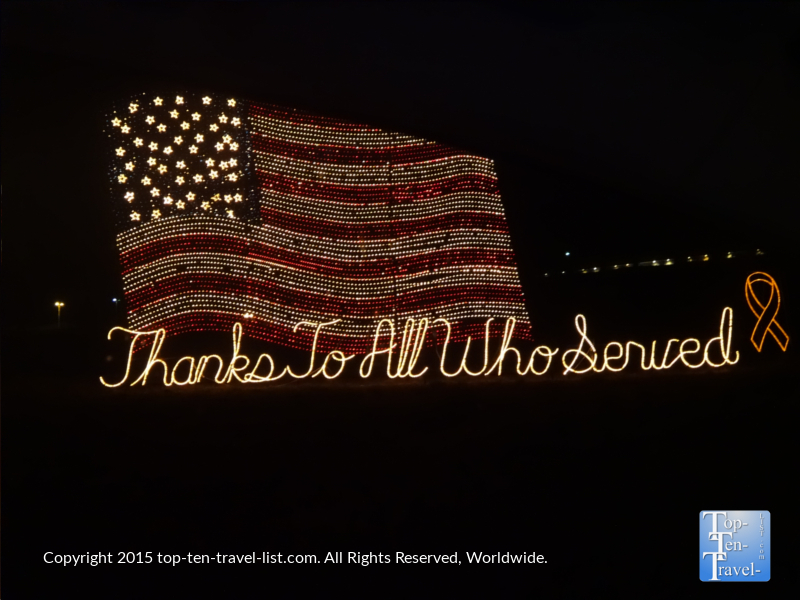 It’s open 24/7 for holiday viewing up until New Year’s. 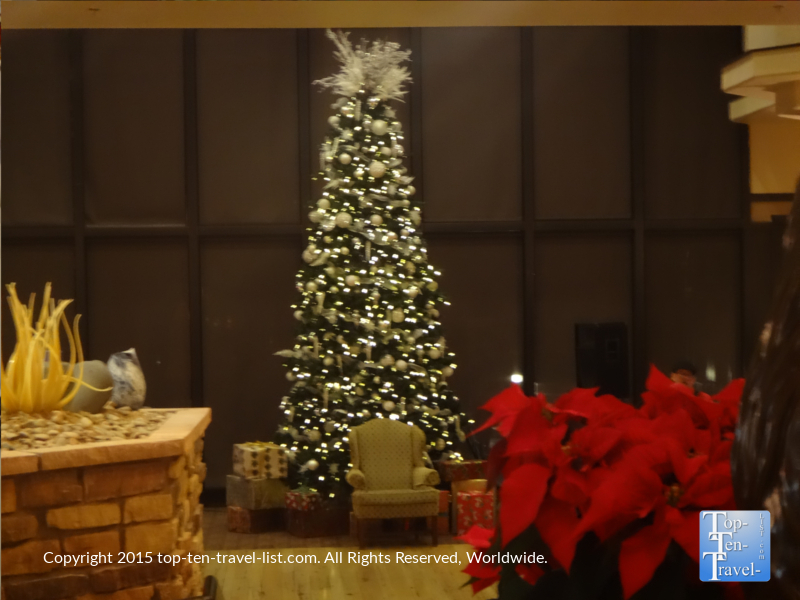 Be sure to also check out the beautiful holiday tree! 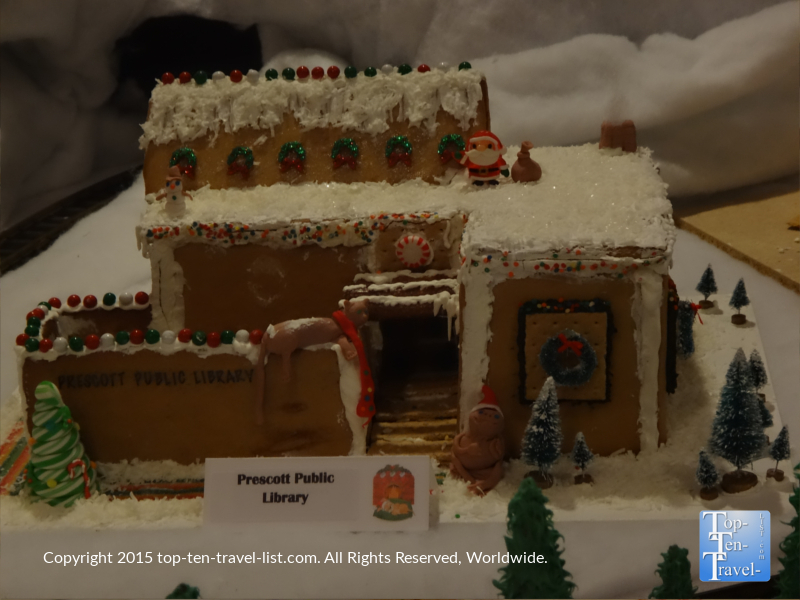 Have you ever attended any of the mentioned holiday activities in Prescott? 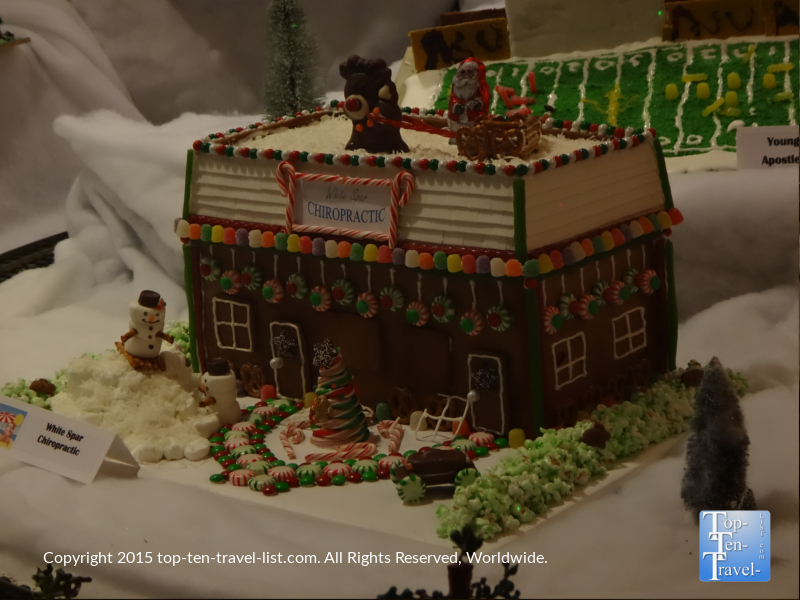 What other holiday related events would you recommend?